Paintball is one of the most popular recreational activities around. Who knew it all started with two friends trying to settle an argument over whether a city stockbroker or nature and fitness loving outdoorsman had better survival instincts. Hayes Noel, a successful Wall Street stockbroker, and his friend Charles Gaines, a writer, fly fisher, and bodybuilder, most widely known for writing the books “Stay Hungry” and “Pumping Iron,” were discussing this argument at length in the late 70’s. During this time another friend of Gaines’s was reading an agricultural magazine and found and for a gun made by a paint company that shot oil-based paintballs. The gun was marketed for use by foresters for marking trees and to ranchers for marking cows. Noel and Gaines were intrigued with the idea of using the guns to sort of settle their little argument. They decided to test the gun’s impact on marking humans with a duel held at 20 paces. Gaines won that first showdown. Once they knew the gun would be safe to use on humans, they began the framework for a survival competition with the help of friend Bob Gurnsey who owned a ski equipment store. June 27, 1981- The three men went to a 100-acre wooded piece of land in Henniker, New Hampshire along with nine other friends all dressed in ski shop goggles and camo. They, of course, all had Nel-Spot 007 guns from the magazine ad with them. The objective of the game was to obtain a flag from four different stations while avoiding being shot. The winner of this first paintball game was Ritchie White. He was a forester who played so stealthy he never needed to use the paintball gun. The answer to the original argument between the two friends was for the rural survivalist. Once home one of the game players wrote an article about the adventure that ran in an issue of Sports Illustrated. From this article, a large number of readers sought out Gaines, Noel, and Gurnsey to play a game of paintball. From a lot of inquiries the three men decided to start a paintball company called The National Survival Game and received a license from the gun maker, Nelson Paint Company, for non-agricultural use of the Nel-Spot 007. Over the course of the following 15 years, Gurnsey continued to develop the game of paintball into what it is currently. Today there are more specialized guns, water-based paint in paintballs, much better safety equipment, fields and arenas just for paintball, and liability insurance. 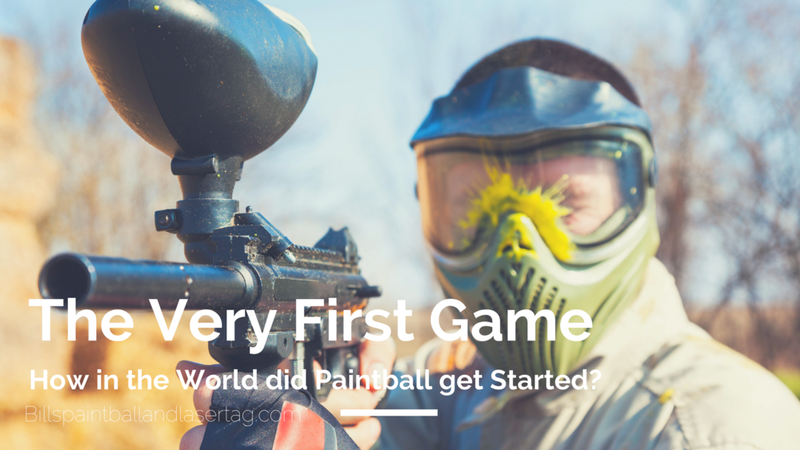 Today paintball is one of the safest and most fun methods of competitive and strategic play. It is safe for older children and adults alike. You can even make it a fun family game time. For more paintball fun come check out Bill’s Extreme Paintball and Tactical Laser Tag.